Australian spiders have a fearsome reputation, but our bees typically pose more of a threat. Here are the worst. SPIDERS tend to incite more fear than favour and even provoke phobias for some, particularly many visitors to our shores has been more than a little worried about our venomous eight-legged friends. It’s true that we have some of the most venomous spiders in the world – but Australia’s spider reputation is bigger than its bite. The first recorded spider death was in April 2016, since 1981. Spiders are the most widely distributed venomous creatures in Australia, with an estimated 10,000 species inhabiting a variety of ecosystems. But even though spiders live around us, from our urban centres to the bush, bites are infrequent. Records indicated that spiders are less life-threatening than snakes or sharks, or even bees. Antivenom for two of our more dangerous spiders, the funnel-web and the redback has been available since the 1950s and 1981, respectively. It is only administered when the envenomation is severe. Spider venom contains a cocktail of chemicals, some of which can be harmful to humans – but humans are not really the intended victims. Spider venom is designed for small prey and delivered in small quantities that, while often fatal to tiny creatures, can be handled by bigger organisms. When injected to a horse, for instance, spider venom triggers the animal’s immunesystem to produce antibodies to fight the effect of the toxin. Webbing Spiders: How the service is carried out? Our technicians do not use air borne sprays inside the home. A spot treatment will be used if required. This means that the service is not disruptive and there is no need for you to empty cupboards or vacate the premises while we service your property. Our service is safe and there is no odour left after it. If the technician needs to spot spray any areas inside your home the application used will not leave any odour or residue as the application is targeted to the spot where the spider is found. Ground Spiders: How the service is carried out? Our technicians carry out a thorough spray treatment to all external ground and garden areas around the home where ground dwelling spiders may be living. Ground dwelling spiders live in burrows beneath the soil, in gardens and under logs and rocks. 1. Sydney funnel-web: With highly toxic venom produced in large amounts and large fangs to inject it, the Sydney funnel-web is without a doubt the deadliest spider in Australia, and possibly the world. Found in New South Wales, in forests as well as populated urban areas, they burrow in humid sheltered places. They can wander in backyards and sometimes fall into swimming pools, and though they’re not often encountered, they can be quite aggressive when threatened. Though just 1.5-3.5cm big, the Sydney Funnel-web has fangs larger than a brown snake’s and so powerful they can even pierce through nails and toenails. Their venom has a compound that can attack the human nervous system and alter the functioning of all organs and, when coming from a male, can kill. One in six bites causes a severe reaction, but since the antivenom has been made available, in 1981, no fatalities have been recorded. Other funnel-webs: There are about 40 species of funnel-web spidersinAustralia, but only six have been reported to cause severe envenomation, with victims generally around southern Queensland and northern New South Wales. The impressive northern tree funnel-web spider, Hadronyche formidabilis, (4-5 cm long) and the smaller southern tree funnel-web spider, H. cerbereaprobably count as the most dangerous ones. Half their bites result in severe envenoming. Every year, up to 30-40 people are bitten by funnel-web spiders. But antivenom is available and proved very effective. They feed on prey ranging from beetles to frogs and appear to be generally more active in the warmer months, between November and March. Redback spider(Latrodectus hasselti): Redback spidersare found throughout Australia, in many habitats, including urban areas. They often hide in dry, sheltered places such as garden sheds, mailboxes and under toilet seats. Numbers of redback spider bites are uncertain, but about 2000 are reported each year and about 250 people receive antivenom. No deaths have been recorded since redback antivenom became available in the 1950s. Most serious bites are from the female redback spider, which measures about 1cm long (bigger than males) and is recognisable by the well-known red stripe on its back, from which it gains its name. Their venom affects the nervous system, which is potentially dangerous for humans, but their small fangs make many of the bites ineffective. Envenomation can cause various effects, but the main symptom is severe and persistent pain – which can last hours to days depending on the person’s sensitivity to the venom – and may include nausea, malaise and lethargy. Cupboard spiders (Steatoda sp.) are often mistaken for redbacks and they produce similar symptoms, though their venom is less potent. Redback venom is effective against these bites. Mouse spider(Missulena sp. ): There are eight species of mouse spiderfound all across Australia and they’re typically found in burrows, often near rivers or waterways, and can occasionally be found in suburban areas. Their venom is similar to the funnel-web spiders, although no deaths have been attributed to them; only one case of severe envenomation has been recorded. Studies have shown the funnel-web spider antivenom to be effective for mouse spider envenomation; and because it is sometimes difficult to tell the two species apart, the bites should be treated with the same precaution. Mouse spiders are rather lethargic and rarely aggressive. The females generally remain in their burrow, while the males wander looking for them, generally in late summer to early winter. Unlike other spiders, mouse spiders are often active during the daytime, while other species from the same family prefer to wonder at night to avoid the heat and the day-active predators. Trap door spiders(Idiopidae family): These spiders are named after their habit of camouflaging the entrance of their burrow to trick their prey into falling inside. They measure about 1.5 to 3cm long and as is often the case, females are distinctively larger than males but males tend to be more aggressive when feeling threatened. Found throughout Australia’s natural or urban environments, trap door spiders cause only minor symptoms for humans, generally inflicting only localised pain, but sometimes nausea, lethargy and malaise. Just like the mouse spiders, trap door spiders are often mistaken for funnel-web spiders, especially since the early effects of their bites are similar; these spiders should therefore be treated with caution. While most spiders live for about one year, trap door spiders can live between five and 20 years. White-tailed spiders(Lampona cylindrataand L. murina): White-tailed spiders are found in natural and urban areas across southern Australia, from south Queensland to Tasmania and from east to west coast, and white-tailed spidersin eastern Australia. Unlike burrowing spiders, white-tailed spiders are vagrant hunters and wander about at night, hunting other spiders. Though white-tailed spiders have a reputation for releasing necrotising (flesh-eating) venom, the scientific evidence doesn’t support this assertion. More likely, the spiders were wrongly held to blame for difficult to diagnose skin ulcers. Recent studies have shown the venom causes no major danger to humans and is limited to mild local pain. Australian tarantulas: Australia has its own native tarantulas, though they’re also known as whistling or barking spiders because of the sounds some species can produce by rubbing their front limbs against their jaws. They are also called bird-eating spiders, although it is rarely justifiable. These spiders mostly feed on insects, including other spiders, lizards and frogs and would occasionally prey on bird hatchlings. Only six species have been officially identified, though it’s likely many more exists. Despite their intimidating large size and hairy legs, (6cm body and up to 16cm legspan) tarantulas aren’t fatal to humans; they can render painful bites because of their large fangs (1cm long), but severe effects (nausea, vomiting, fever) are rare. They can, however, kill dogs. Females live for about 12 years and males about five. Recluse spider(Loxosceles reclusa): Alson known as a fiddleback spider, the recluse spiderhas potentially dangerous venom that can be haemotoxic, damaging the blood and skin as well. Alarming emails have circulated about this spider inflicting terrible damage to human tissue but this was only a hoax meant to scare people. In 20 years that fiddleback spiders been known to exist in Australia, their range hasn’t increased and not a single envenomation case has been reported here, so despite the myth, this spider can hardly be considered dangerous in Australia – though they are a major cause of serious bites in South America. Moreover, they are known to only have tiny fangs to inject their venom and are not inclined to bite. Huntsman spiders(Sparassidae family): Huntsman spidersare widespread in Australia. They are famous for being the big 15cm leg-span scary, hairy, black spiders bolting out from behind the curtains. In reality, they are reluctant to bite and more likely to run away when approached and their venom isn’t considered dangerous for humans. Their danger comes more from causing accidents by the terrified drivers who react to a huntsman jumping out from behind the sun visor or dashboard of a car when it’s in motion. Despite their intimidating size, huntsman spiders can be an ally in the house; they help with pest-control by eating smaller insects. Common garden orb weaver spider(Eriophorasp): As the name suggests, common garden orb weave spidersare a typical sight around Australia. Their bites have only minor effects, such as some local pain, but they are aggressive: they’re the most common spider species to bite. They measure between 1.5cm and 3cm and live in all the gardens, generally weaving webs between trees, on hedges or washing lines, in places where other insects are likely to fly and get caught in the sticky threads. Active at night, they hide during the day and rest with their legs withdrawn under the body, hanging off a thread under a leaf or in the clothes hanging from the line. Northern tree spider: The Northern Tree spider is only found in Queensland and New South Wales. The venom of this spider is potentially fatal to humans, with speculation that the poison almost as deadly as the venom used by the Sydney Funnel Web. The male of species is the most lethal to humans. They are often found burrowed in decaying tree trunks or in fence posts, in rainforest areas. When disturbed, it can become aggressive and changes to a reared-up position similar to the defensive stance of the funnel-web species. The female life span is 5 to 10 years and will grow to 45mm, unlike the male which will only grow to 23mm. Garden wolf spider: A common, low-risk spider, the Garden Wolf is a ground dwelling spider but also enjoys wandering in search of prey. It is one of the most widespread species of wolf spider in Australian and is most commonly encountered in the southern and eastern mainland. They enjoy making holes in the garden, covering the entrance with litter. They are not aggressive but can bite in events where they’re provoked. Garden orb spider: Garden orbs are also found throughout Australia but are found only in the eastern and southern regions of Australia. They are neither poisonous nor aggressive and rarely bite. It is most active at night when they are spinning their webs, and hide during the day under foliage. The female outgrows the male, 20-25mm to 5-10mm. Daddy long legs: Found in a majority of Australian homes, it is commonly found throughout Australia. When outdoors, they enjoy constructing their webs in dark and damp recesses, but when indoors, they prefer warm and dry places like household windows, attics, corners etc. They are very handy to keep in the house as they feed on small insects and other spiders. They will only grow between 2 to 10mm, but their legs can grow up to 50mm. The daddy long leg possesses venom in their fangs and although extremely rare, they can bite but their fangs are too small to inject venom. 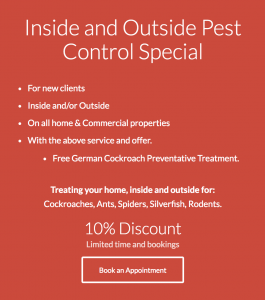 We can help put an end to pest invasion with our dedicated pest control services for both domestic and commercial customers.